Next time leave a note under the wiper blade? Remember when we had to actually write? Here in Austin I've seen quite a few. There was a guy in our hood who had 2 sitting in his driveway, a white 633 and red 635. I would drive by all the time and they never moved (on my way to work, not stalking!) so I finally knocked on the door and asked if he was interested in selling one. He said funny you should ask because my wife really wants me to get rid of one! Now I have the red one. masonjones wrote: Here in Austin I've seen quite a few. There was a guy in our hood who had 2 sitting in his driveway, a white 633 and red 635. I would drive by all the time and they never moved (on my way to work, not stalking!) so I finally knocked on the door and asked if he was interested in selling one. He said funny you should ask because my wife really wants me to get rid of one! Now I have the red one. Thanks guys! Yeah, the white one was in better shape but the red one was the one I could afford. No regrets though, it's rust free and runs great! Well, the engine runs great anyway... ...I've been soaking up the knowledge here and on the bimmerforums. My last few classics have been old British cars which were great but now that I'm a little older I find I'm liking the comfort level of the 635. No goggles and scarf required! Spotted a lovely 635 at the London Classic car show yesterday Couldn't find the owner though. G reg Highline (looked like dolphin grey) on the A4 Great West Road Eastbound turning on to Heston Road at 6:15pm this evening. I've had my E24 since August of '15 and still haven't seen another one on the roads around here. I can't even remember the last time I saw an E24 locally, but it had to be at least 10 or 15 years ago. Same story with my Alfa's - just don't see any around, unless I go to some kind of organized event. Oh geez Tommy . . .
Looks like yet another fake Alpina. Why? dwcains wrote: Looks like yet another fake Alpina. Why? Is it fake? And you'd think they'd straighten up the damn front id plate. Car looks awesome otherwise. Dubai ...unlimited cash to play with cars. Besides the people I know, I have only seen one or two out in the wild the past couple of years. 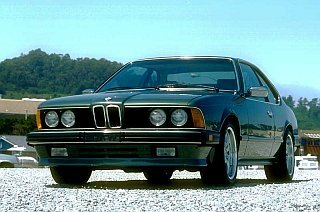 Alpina and its titillating noises. Saw my first E24 in more than a year. Not in England though! It was a silver model parked in the French town of Poncin (Ain Department) on the D1084 at about 13:20 yesterday. Shark sighting in Queens New York on Astoria Blvd at 88th Street. It was painted a flat black/charcoal color. Had a not so OEM sounding exhaust on it. On my way back from my local dealer after ordering a couple of little bits for my M635, I've just sighted a grey Highline in Chigwell, Essex, UK. Registration number F477TRR. Monday morning, May 16th . . . Still waiting for the first person in this thread to say, "Hey, that was me!!!" This one showed up at the BMW CCA Chapter meeting tonight. On May 14 I was driving south on 29 just south of Calistoga and saw a gray Shark heading north around 5pm. We spent three weeks in Europe last month (southern Germany, Alsace and Zurich) and saw just two 6's. They were both in the BMW Museum though. Does a guilt free shark have a feeling of remoras? It's funny: I never used to bother relating sightings of sixers because it was relatively common to see a couple in the town I live in. Last Sunday, I saw a fleeting glimpse of a D reg car in Swindon going around the roundabouts where there used to be four roundabouts next to the place that used to be a wine merchants near to where the Oasis was before they knocked it down / covered it up for refurbishment! It was a darker metallic shade, grey I think and appeared to have open lug Alpinas. As you can probably tell, I was feeling a bit old driving round my home town to find everything has changed. Luckily the overwhelming sense of identity and richness of heritage which any resident of Swindon feels upon returning home was still there. Came across BMW UK's M635CSi from their classic collection, getting ready for display at the Goodwood Festival of Speed. The emerging corrosion on the rear arched needs some attention, the leather could do with a feed, and the sunroof lining was hanging down, but other than that it was looking pretty good. Now showing 77,200 miles. edit. Someone took this video clip during the event, with the car now on the stand. The keener eyed amongst you might spot that the vehicle data display board shows that BMW see the value of this car at £35k. That's bang on the money, I would have said. Last edited by Soperman on Tue Jun 28, 2016 4:59 pm, edited 1 time in total.